How Disconnected are Older Adults and Youth in Toronto? “I want to be respected,” said the older adults. “I want to be respected,” said the youth. “We’re not invisible!” said both. At the root of intergenerational conflict is the need for respect; both groups, young and old, want to be heard, recognized and understood. 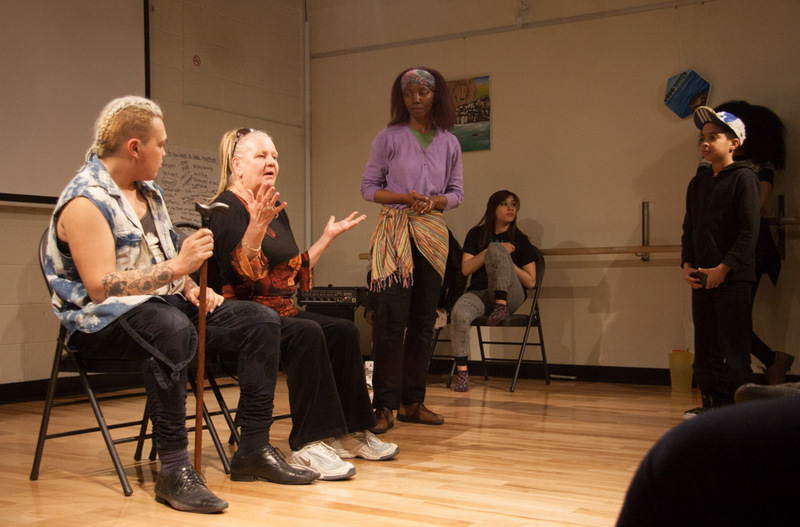 On March 20th, the interGEN project brought youth (between ages 9 to 18) and older adults (between their 50s and 80s) together to share their stories through theatre. The older adults performed C’mon Granny (written by Luciano Iogna) and the youth performed, Dis-connected (written by Alicia Payne). The March Break youth participants worked with facilitators Kristin Bartlett and Alicia Payne to create scenes that illustrated what it felt like to be a teen in Toronto: Dis-connected is a collection of scenes that illustrate the tension that exists between youth and older adults—particularly in diverse and urban contexts. Both groups identified public transportation as a place fraught with intergenerational conflict. A 14-year old youth, who played the role of an older man who couldn’t find a seat on a bus because two young girls took up an entire row of seats and refused to let him sit down, reflected on his experience: “I now know what it feels like to be old. Those girls were so mean to me. They had no respect.” The 14-year old went on to explain how it felt to “get a glimpse of life in the future.” Clearly, the experience of taking on the identities and perspectives of older adults had an impact on these youth. Through the weeklong workshop the youth explored issues such as, the impact of technology on their lives, the need for freedom, and sharing experiences of what it is like to be a new resident in the city. All of these themes culminated in the multiple scenes that led to the creation of Dis-connected. In the final scene, the youth indulged in alcohol at a house party and ostracized an “uncool” kid, forcing her to leave the party. One young girl chose to accept a “special” drink offered to her by a young man. The youth all started to dance, and engaged in a lively, choreographed performance—and then that young girl with the “special” drink fell to the floor. Everyone ran away, leaving her collapsed on the floor—and the scene ended. At the end of each performance, Simon Malbogat and Alicia Payne each opened up the stage to the audience: Is there anything you would change? What could we do differently? The youth, older adults, and audience members actively participated in the discussion and interventions—each taking on different roles, and exploring alternative outcomes to manage and challenge the injustice and disrespect they witnessed. One audience member attempted to humanize the thief in C’mon Granny—attempting to show how an “oppressor” experiences oppression, such as poverty and lack of social networks. Many audience members attempted to take on the role of the young girl who accepted the “special drink.” This resulted in a theatre-wide discussion with both the youth and older adults sharing moments where they found themselves in uncomfortable and dangerous situations. As they shared different and similar perspectives they appeared to find a place with common ground, and while no consensus was reached on the final “right” answer, the conversation definitely sparked a healthy debate—one that allowed and encouraged participants to openly and safely express their fears and experiences with alcohol. MCT intends to continue to encourage youth and older adults to come together to explore intergenerational issues through theatre. If you’re a youth or older adult in Toronto, reach out to MCT to find out how to get involved, and join this important dialogue.